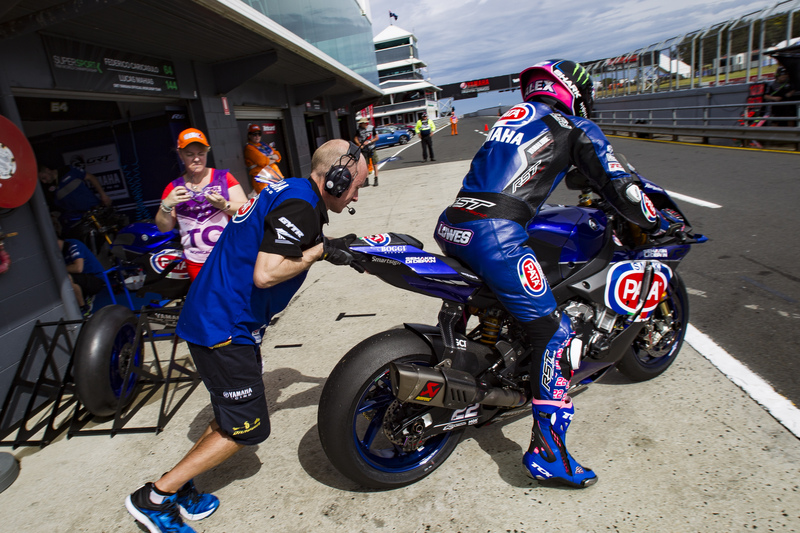 Mixed weather greeted the Pata Yamaha Official WorldSBK Team on Friday at the opening round of the 2018 FIM Superbike World Championship and the team were forced to deal with mixed fortunes throughout the day. Michael van der Mark impressed during the official test earlier in the week at Phillip Island and kept up this form to finish Friday in seventh on the combined timesheets with a 1:31.114, 0.707s off the quickest rider. His teammate Alex Lowes showed superb fortitude to bounce back after a crash in FP2, which forced him to miss the entire session, making up for lost time in FP3 to set a 1:31.516 and end the day in tenth overall, with both riders making it through to SP2 on Saturday. A key change to Friday’s for the 2018 WorldSBK Championship is the inclusion of a third forty-minute practice session, with the top ten riders on the combined timesheets at the end of the day automatically making it through to SP2 on Saturday. This would prove to be vital as the weather played a crucial role on the opening day of the season, with rain in the morning meaning FP1 saw the riders out on wet tyres before conditions improved for a dry FP2, allowing riders to head out on slicks. Rain once more fell at the island before FP3, with a drying track meaning riders had to push to the absolute limit to try and improve their times. Van der Mark showed great pace during the official test earlier in the week and was determined to get his 2018 campaign off to the best start possible. Despite the wet conditions in FP1, he immediately settled into a good rhythm on his Pata Yamaha R1, ending the session in ninth after setting a 1:41.939 and gaining some valuable wet track time, which could be essential with a mixed forecast for the rest of the race weekend. The 25-year-old Dutch rider then improved to a 1:31.114 in a dry FP2, before using FP3 to focus on his setup and race pace. While van der Mark did not improve during the final session of the day he managed to display excellent consistency once again and his time from FP2 meant he ended the day seventh overall on the timesheets, 0.707s off the top, which was good enough to cement his place in Superpole 2. His teammate Lowes got off to a great start in the morning’s FP1, making the most of the wet conditions to finish the session in fifth with a 1:43.472. Unfortunately for the 27-year-old British rider, he then made a small mistake and crashed at Lukey Heights on his first flying lap in FP2 and, while he walked away unhurt, his bike suffered considerable damage. Forced to miss the rest of the session as the team repaired his Pata Yamaha R1 and, having not been able to set a time in the dry, Lowes watched on nervously as rain fell before FP3. Luckily, the rain went away before the start of the session and while conditions were not perfect, the 2013 British Superbike Champion immediately went out and made up for lost time, setting a 1:31.596 to move into the top ten within minutes of the session being green flagged. He improved again towards the end of FP3 to a 1:31.516 to secure tenth overall on the combined timesheets and ensure that he joined his teammate in making it through automatically to SP2 on Saturday. The Pata Yamaha Official WorldSBK Team return to action on Saturday at 9.40 am local time for FP4, with SP2 at 12:55 pm and Race 1 scheduled to start at 15:00 pm. Check out the full results.